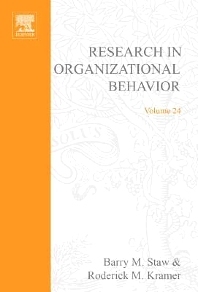 The chapters in this collection address a variety of concerns in organizational theory, ranging from the evolution of organizations and cross-cultural analyses of managerial behavior to the micro-sociology of knowledge brokering within organizations and the etiology of organizational messes. Swaminathan, examines resource partitioning theory, an important theoretical perspective in population ecology. The next three chapters, broadly construed, address issues of organizational innovation, learning, and adaptation in complex environments. The next contribution, by John Carroll, Jenny Rudolph, and Sachi Hatakenaka examines how high-hazard organizations learn from experience. As with all organizations, high-hazard organizations such as nuclear power plants and chemical plants attempt to learn from experience in order to improve performance and, of course, to avoid catastrophic failure. Unlike many other kinds of organizations, however, failure to learn from prior experience-especially with respect to learning effectively from errors and mishaps-can prove extremely costly and even fatal. Hence, these organizations must balance between learning and control, and must do so under conditions of considerable oversight and scrutiny. provocative analysis of the role disorganization plays in organizational life. The two following chapters in this volume provide important overviews of theory and research on classic phenomena within organizational theory, followed by original theoretical syntheses. Robert Baron's chapter then undertakes a fresh and useful examination of the burgeoning literature on entrepreneurship and the two final chapters in the volume examine essential issues related to our understanding of organizations and the cultural environments in which they are embedded. Barry M. Staw is the Lorraine T. Mitchell Professor of Leadership and Communication at the Haas School of Business, University of California, Berkeley. He received his Ph.D. from Northwestern University and has previously served on the faculties at the University of Illinois, Northwestern, Iowa, and UCLA. He is the author of more than 60 academic articles and has edited several hooks on organizational behavior. He has served on the editorial boards of most major journals in the fields of organizational behavior and applied psychology, and is founder and co-editor of the annual series, "Research in Organizational Behavior." Professor Staw's current research interests include the relationship of affect and emotion to work performance, the escalation of commitment, organizational innovation, and the linkage of psychological processes to organizational strategy. He recently received the Academy of Management's Scholarly Contributions Award in recognition of his career achievements in research.